New mobile applications from HowGood want to help shoppers become better informed about which food is best to eat – and not just which food is healthiest, as the name suggests, but whether the animals were treated humanely, if the workers were paid fair wages, if the food was produced locally or sustainably, and much more. In addition, the company is announcing that in order to accelerate growth, it has taken in $2 million in outside funding from FirstMark Capital, Highline Ventures, Great Oaks Venture Capital, Serious Change LP, Jake Lodwick and Joanne Wilson. Founded back in 2007, HowGood is an established research organization based in New York, which has developed its own rating system to identify the leaders in the food industry. It licenses that data to smaller grocers in 21 states across the U.S., as well as other food and tech companies. 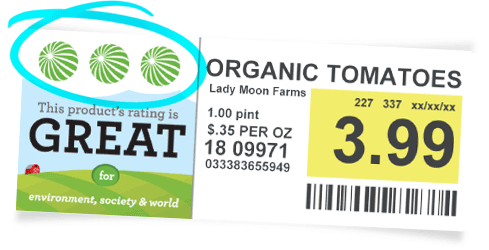 HowGood determines the overall “goodness” of foods and awards ratings to the best products in an effort to aid consumers who are interested in making smarter, more sustainable shopping choices. That system today includes over 60 benchmark indicators of a company’s behavior, ranging from the ingredients to the manufacturing process to the way workers are treated. HowGood looks at nearly every factor that goes into a food’s production, even things most consumers don’t think about when dropping items into their shopping cart – like carbon emissions or concerns around hazardous waste. HowGood’s mobile applications arrive at a time when a growing number of people are becoming interested in making better food decisions, and not only for health reasons. Of course, health is still popular reason for changing one’s shopping behavior, with things like the paleo, vegetarian/vegan, gluten-free and raw food diet trends as a contributing factor, not to mention research that shows how diet changes can impact a number of health issues, or even lower cancer risk, in some cases. But a number of shoppers, and especially younger consumers, are increasingly aware of the benefit of buying sustainable products from socially responsible companies, and are sometimes even willing to pay a premium for these goods. That groundswell movement is especially impacting the organic food market, which is now expected to grow 14% from 2013 to 2018, with 81% of American families now saying they buy organic sometimes. Meanwhile domestic organic food production is up 240% between 2002 and 2011. Whole Foods has benefited from this change, though it’s now having to fight off rivals who have increased their own natural-goods selections. Shopping organic is just one sliver to what it means to shop sustainably, however. Several tech companies today are offering online “green” shopping destinations, like Amazon-owned VineMarket.com, sustainable grocery shop ePantry, or the Jessica Alba-backed eco-friendly marketplace The Honest Company, for example. But when you’re out shopping in the real world, it can be difficult to make the best decisions. That’s what HowGood aims to change with its mobile apps. The apps, now available on iOS and Android, let you search and navigate through product listings, or scan the barcodes on the packaging to view the ratings. The scoring system is also kept simple, with one, two or three globes indicating good, better and great, respectively. That helps you make a quicker decision without having to get bogged down in deciphering the data. At launch, the company has rated over 100,000 products, and found that only 6% of the industry earned the highest rating, which proves there are challenges ahead for those who shop by stricter guidelines. But already, the information HowGood provides is having an impact, the company says – it has actually seen a 27% increase in sales of products that have the highest rating in stores that use the ratings to promote products on the shelf. HowGood declined to provide specifics around its own sales data and revenue, but notes that its 16-person team is now growing thanks to the new financing, and it’s hoping to expand its in-store ratings system (which helps grocers promote sustainable products to boost their own bottom lines) to larger grocery stores going forward. The new apps are free downloads here.